Here it is—the muthafuckin’ blueprint for a style of funk that seemingly has infinite staying power. 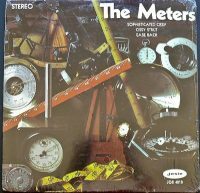 The Meters’ debut LP is an ideal specimen of precision-tooled, just-the-brass-tacks-ma’am of New Orleans dance music, which has influenced generations of funk musicians and turned on millions of aficionados—while also providing a banquet of sampleworthy passages for hip-hop producers. Eternal thanks to Leo Nocentelli (guitar), Joseph “Zigaboo” Modeliste (drums) George Porter Jr. (bass), and Art Neville (keyboards) for their evergreen innovations. On The Meters, these cool-headed gentlemen concocted a spare geometry of rhythm that always equals satisfaction where it counts: in the hips and the ears. Their concise compositions get to the point—which is a very important, rewarding point—and then efficiently move on to the next fundamental equation, which they elegantly solve, over and over again. That may sound a bit dry, but trust me, what the Meters do here is very lubricious. The opening track, “Cissy Strut,” actually was a hit in 1969, selling 200,000 copies in two weeks, according to Wikipedia. It’s staggering to think that we once lived in a world where a stark instrumental funk cut could chart; my, how far we’ve fallen. Anyway, “Cissy Strut”—which has been sampled at least 60 times— is a seminar conducted by badass musicians casually placing every element in a song to maximize its innate funkiness. Special mention to drummer Modeliste, whose embellishments are tricky as hell while never losing the funk. Amazing four-limb dexterity! Elsewhere, “Here Comes The Meter Man” comes off as both Southern-fried and as cool as sweet tea, with Neville’s organ a churchy swirl of carefree joy and Nocentelli’s guitar a quicksilver wonder of economy and liquid bliss. “Cardova” the epitome of the Meters’ special brand of methodical funk. You’d think something this orderly wouldn’t be interesting, but you’d be quite wrong. “Sophisticated Cissy” is more laid-back than its kissing cousin, “Cissy Strut,” and perhaps a tad funkier as a result. In my considered opinion, “Sophisticated Cissy” is summer-porch-sitting jammage par excellence. The cover of Sly & The Family Stone’s “Simple Song” slams just as hard as the original, but with fewer frills (like horns and vocals); it’s tighter than a military drum corps and infinitely more exciting.